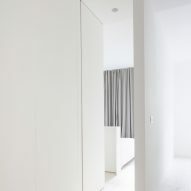 HASA Architects transforms London apartment into "seamless white box"
HASA Architects has turned a dark and dingy apartment on the second floor of a three-storey Edwardian Terrace in London's Bankside into an all-white minimalist family home. Located on a dense urban site in London Bridge, the two-bedroom apartment had previously been served as an office space – giving it a layout described by HASA Architects as "unconventional with dark and unwelcoming rooms". To create a brighter interior, the architects removed all the existing partitions and inserted a series of vertical panels. The open-plan layout allows light to infiltrate each room and provides better visual connections across the apartment. Connected by a central axis, the vertical white-oiled Douglas Fir panels divide up the living and sleeping spaces. Full-height hinged doors fold back into the walls out of sight to allow for varying degrees of privacy. 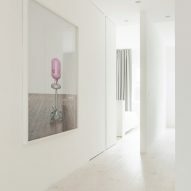 To complete the all-white scheme, the architects fitted bleached timber flooring, while colourful art and furniture pieces are used to accent the space. A kitchen island separates the kitchen from the living area, which was conceived as one connected communal space. Located at the front of the property, the kitchen and living area is a social space where the family comes together to cook, eat and relax. 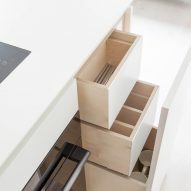 A series of cabinets that back onto the shower enclosure provides additional worktop space and storage in the kitchen. The bathroom is finished in basalt – a dark volcanic stone that sits in contrast to the rest of the apartment. Facing the rear elevation with doors that lead out onto a small terrace, each of the apartment's bedrooms comprises built-in beds, storage and wardrobes. "The precision of the design builds on the small floor plan to create a generous sense of space and allows the users to control areas to suit their needs," summarised Mark Stevens, director at HASA Architects. "We chose the materials for their ability to reflect light throughout the apartment and to create a seamless box that the homeowners can make their own." 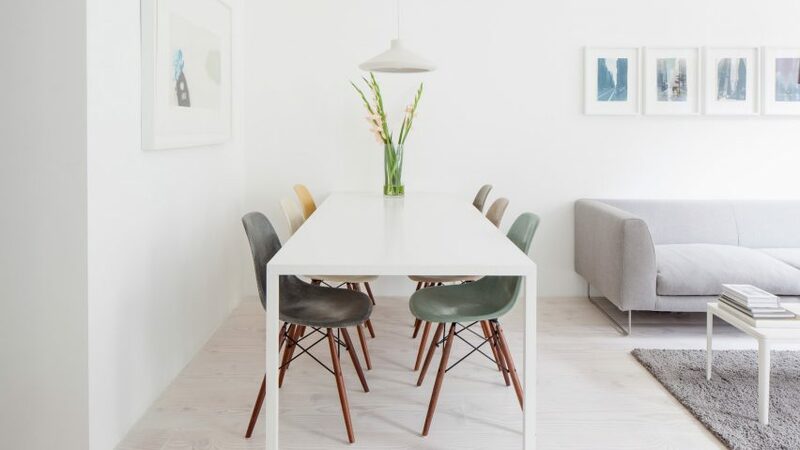 The all-white colour scheme has proved to be so popular with architects and designers of late, that earlier this year Dezeen created a round-up of the most popular all-white interiors.